Japan’s prime minister, Shinzo Abe, has made a visit to a controversial war shrine in Tokyo, prompting a furious response from China and concern in the US. Abe, who became prime minister for a second time exactly a year ago, is the first Japanese leader to have visited the Yasu­kuni shrine since Junichiro Koizumi just over seven years ago. A conservative who has spoken of the need for Japan to end its “masochistic” feelings of guilt over its wartime conduct in Asia, Abe had voiced regret that he did not make the pilgrimage during his first, year-long term as prime minister from September 2006. Thursday’s visit sparked predictable outrage from China and South Korea, which view Yasukuni as a potent symbol of Japanese militarism, and visits by politicians as evidence that Japan has yet to atone for atrocities committed in parts of China and on the Korean peninsula in the first half of the 20th century. “The Chinese government expresses strong indignation at the Japanese leader’s trampling on the feelings of the people of China and the other war victim nations, and the open challenge to historical justice … and expresses strong protest and serious condemnation to Japan,” China’s foreign ministry said in a statement. China later stepped up its response by summoning Japan’s ambassador in Beijing, Masato Kitera, to lodge a “strong protest”. “We can’t help deploring and expressing anger at the prime minister’s visit to the Yasukuni shrine … despite concerns and warnings by neighbouring countries,” Yoo said. Yasukuni honours about 2.5 million Japanese who have died in wars since the late 19th century, including several wartime leaders convicted as class-A war criminals by the allied tribunal. Abe insisted he had “no intention” of hurting the feelings of the Chinese or South Korean people. “There is criticism based on the misconception that this is an act to worship war criminals, but I visited Yasukuni shrine to report to the souls of the war dead on the progress made this year and to convey my resolve that people never again suffer the horrors of war,” he told reporters. He attempted to strike a conciliatory note, saying his pilgrimage had been made in light of his “severe remorse” over the past, although he did not make specific mention of Japan’s brutal occupation of parts of China and the Korean peninsula. Abe would have expected strong words from Beijing and Seoul, but not the US’s rare public expression of concern. In a statement carried on the website of the US embassy in Tokyo, the state department said: “Japan is a valued ally and friend. Nevertheless, the United States is disappointed that Japan’s leadership has taken an action that will exacerbate tensions with Japan’s neighbours. Japan’s foreign minister, Fumio Kishida, later explained Abe’s reasoning for the visit in a telephone conversation with Washington’s new ambassador to Tokyo, Caroline Kennedy. 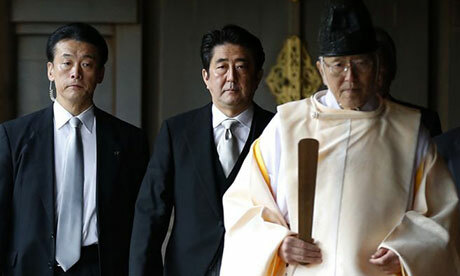 The visit is expected to inflict more damage on Japan’s ties with its neighbours. Japan is embroiled in a long-running standoff with China over a group of islands in a strategically important area of the East China Sea, known as the Senkaku in Japan and the Diaoyu in China, and with South Korea over sovereignty of the Takeshima islands, known as Dokdo by South Koreans.